The Grand Prix Divers Club, though restricted to former Formula 1 grand prix drivers, also embraces a number of Membres d’Honneur, people who have been involved with Formula 1 over the years and who have become legendary for what they have done. One such is Jo Ramirez who was born in Mexico City in August 1941. “ I come from a large family and I have five brothers and three sisters.Though my brothers were involved in football and architecture I was always interested in cars, specifically racing cars, so I wanted to be involved with them”. 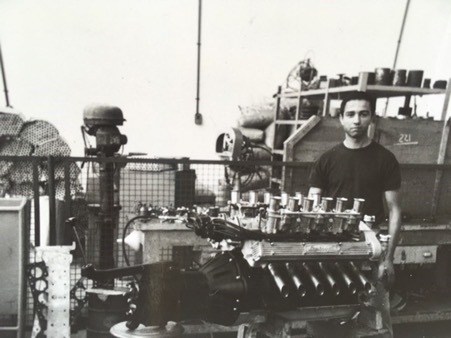 He went to engineering college in Mexico but it was his friendship with the Rodriguez brothers that really set him off in the motor racing field. He was particularly friendly with Ricardo Rodriguez as they were roughly the same age and they would go karting together. In 1961 Ricardo was given a drive by Ferrari in the Italian Grand Prix and when he qualified second he became, at 19, the youngest driver to qualify for the front row of the grid in any Formula 1 grand prix. In the race he battled with Phil Hill and Richie Ginther for the lead. Enzo Ferrari immediately signed Rodriguez for Scuderia Ferrari in 1962. “ I told Ricardo that I would come to Europe and perhaps he could introduce me to one or two people. I also wanted to become a racing driver and had raced a few saloon cars in Mexico, nothing very exciting. 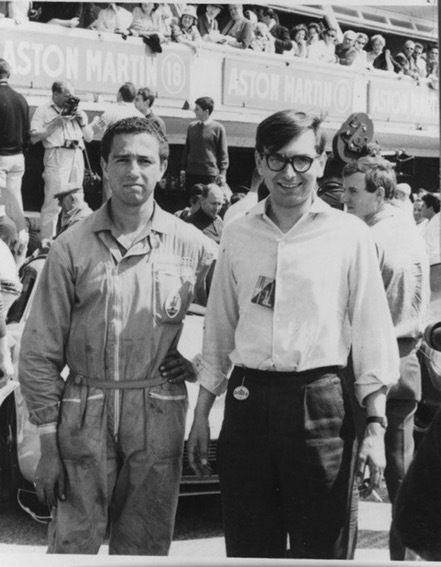 “ I came to England sailing on the Queen Elizabeth as it was the cheapest way to travel and eventually met up with Ricardo at the Targa Florio where I met Mauro Forghieri and Eugenio Dragoni, the Ferrari team manager. They were later to become very important in my career”. They explained they did not have a place for him on the team because he was not Italian and did not have a work permit but if he was able to get himself to the races they would pay his hotel bill and food. This is how Jo spent his first year in Europe travelling to the races with Giancarlo Baghetti and making new friends. It had been a bad season for Ferrari with industrial action and as time went on the Ferrari mechanics would give him the odd job to do “……rather than just cleaning the car and being the teaboy. 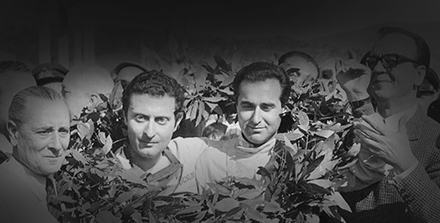 “ During that year I also met my hero Juan Manuel Fangio and he introduced me to engineer Giulio Alfieri at Maserati. He told me they would give me a letter which said that they needed me to do a job no Italian could do which would then allow me to get a work permit and that with a work permit Maserati would give me a job. “ Two months later I started working with Maserati first with the chassis people then the gearbox people and I was working with Gian Paolo Dallara and when he moved to Lamborghini he asked me to join him there. I explained that I was more interested in racing than road cars but he persuaded me to join Lamborghini to learn from the start how road cars were developed and built. He also hinted that Mr Lamborghini, after a year or so, might be considering racing. “I must say my time at Lamborghini with the development and building of the original 400 model was very interesting particularly the engineering side. At the same time I joined test driver Bob Wallace in testing the first Lamborghinis and we drove all over Italy. However, at the end of the year I told Gian Paolo that I wanted to get back into racing and was going to England. “ He offered to double my wages if I stayed but we parted on very good terms and I offered to help him if Lamborghini started to sell their cars in England”. 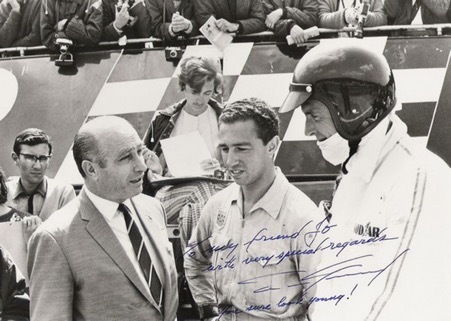 Jo Ramirez arrived in Britain and started to go round knocking on doors and trying to get a job in racing and was lucky to meet John Horsman and John Wyer at Ford Advanced Vehicles. They were working on the original Len Bailey Ford GT40 and so Jo suggested that he work with them for two weeks without pay and if they were not satisfied he would leave. So he started work at FAV and was to meet his future wife Bea during that period. By now he had become very friendly with Dan Gurney and when Dan told him he was starting his own grand prix team, Anglo-American Racers, he asked Jo if he would like to join the team and like a shot he said “…I am your man”. “ I joined Tim Wall, the Australian and Mike Lowman, the best fabricator I ever met, and the original Eagle was built in California and then sent over to us in England where Len Bailey had designed the suspension and everything. That original car had a Coventry-Climax engine which was not very powerful but, with Dan driving, it did very well. Then we had the Westlake V12 engine which was very good but not very reliable. We almost won the German Grand Prix with it but it was a drive shaft that broke when we were leading and not the engine. “ Then Dan lost his Goodyear sponsorship and he asked me to go to America with him as he was going to run in Can-Am and Trans-Am racing so I went over with him and we also did Indianapolis so it was a lot of work. 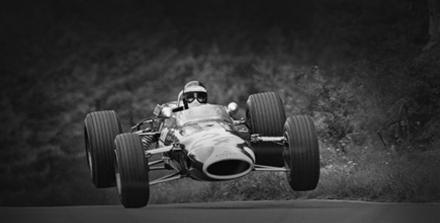 “ When Dan Gurney retired from racing two years later my wife was homesick for England and so we returned”. Once again Jo Ramirez was lucky as he was approached by John Wyer and John Horsman about returning to join them as they were running the Gulf Porsche 917 and were to have a fantastic year with the car. However the 5 litre cars were then eliminated from the World Championship and Jo approached Ken Tyrell about getting back into Formula 1. 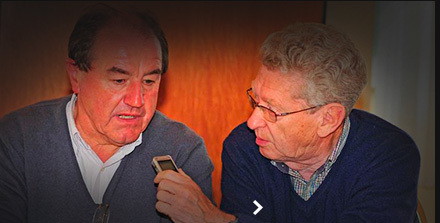 “ I had an interview with Ken and joined them and spent three years there including winning the World Championship in 1973. “ Ken was the most fantastic boss, he was a father figure and going out for dinner with him was a treat for everyone. Then Emerson Fittipaldi approached me about joining him as he was about to develop his Fittipaldi grand prix car with sponsorship from Copersucar. He asked me to be Team Manager as I was familiar with the South American temperament and so I went to Ken who was very understanding. He told me it would be a good move for my career and at the FOCA meetings he offered to help me with background information”. The move to Brazil to oversee the Copersucar development proved to be very tough and he jokingly remarks that that was when he lost his hair! The problem was the Brazilian customs service and the import charges they had for brakes and equipment from Europe. It proved to be a nightmare and the car was delayed because bits and pieces were lying in customs sometimes for weeks. Jo did manage to enlist the help of the Brazilian aeroplane company Embraer for some engineering work locally. When the season started Jo arranged premises in England and though they were due to go back to Brazil at the end of the season he was able to persuade the Fittipaldi’s to stay in England. 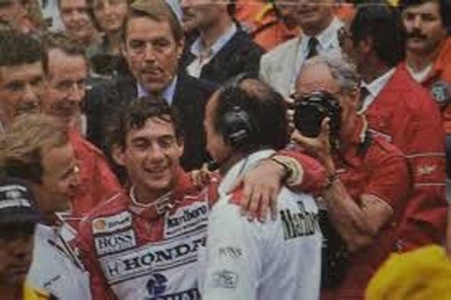 Clearly it was not working out and his long-time friendship with Ron Dennis was about to come into play. “ I knew Ron from the early days when he was working on the Cooper-Maserati and we used to play squash together. Then Ron launched his own Project 4 team in Formula 2 and reached the stage where he had too much sponsorship and he talked to me about organising a second Formula 2 team. “ I was working with Shadow at the time and explained I was virtually my own boss as Don Nichols was in the States all the time”. So turned down the chance. Eventually Ron Dennis and Jo got together and he agreed to join McLaren. It was the end of 1983 and he went into 1984 as the co-ordinator of the team. As this was the first year of the McLarens with the TAG Porsche engines his main job was dealing with the relationship with Porsche, TAG, and Bosch who were handling the complicated electronics. Early on in the relationship Porsche tended to be low key about their involvement but once McLaren started to be successful they were happy to be associated with the McLaren TAG-Porsche grand prix cars. The drivers that year were Alain Prost and Niki Lauda and between them they won 12 grands prix that year with Lauda winning his third and last driver’s World Championship ahead of Prost by just half a point ( 72 to 71.5). It was a remarkably successful period for McLaren not only with the TAG-Porsche engine but later with Honda. As for Jo Ramirez he was to stay with McLaren for eighteen years and finally decided to retire in 2001 when he reached the age of 60. 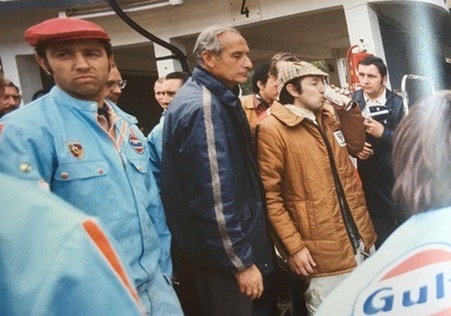 In that time grand prix racing had changed from being a bunch of teams going out and testing and racing to a more corporate culture with meetings to discuss and decide on everything. He realised that things could only get worse and rather than have people ask when he was going to retire he decided to make the decision himself. Was it the right decision ? “ To be honest the next two or three years were incredible, I have never been so unhappy as I missed all the rush and excitement of Formula 1. It affected my relationship with my wife as she suggested I should go back to one of the other teams but I could not face that. Now, looking back, I have to admit I had an incredible life in motor racing. 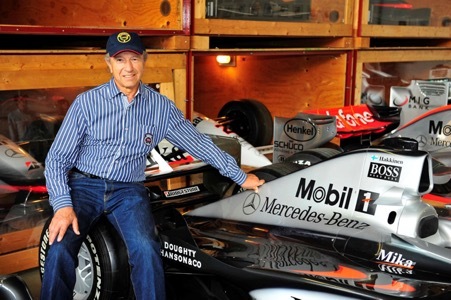 At our Grand Prix Drivers Club General Assembly held in Stuttgart a few years ago I saw all those McLaren-Mercedes cars that Mercedes Benz had collected for their museum and realised just how lucky I was to have been born at the right time with the best years of the sport and I loved every minute of it”. Since he retired from racing tragedy followed. His wife Bea died and seven years later he lost his only daughter. Today he has found happiness with his Viennese partner Ursula and enjoys working on his collection of historic cars and joining his old friends the members of the Grand Prix Drivers Club.